Hello. My name is Jennifer and I think we should start a new kind of quilting club. “What do I mean by ‘new’ kind of quilting club?” You say. Instagramming… Pause for a sec. Do you ever stop and wonder just how many miles you’ve scrolled with your thumb?…Hmmm…there’s some food for thought, eh? Anywho, if you’re a fellow Quilt Lady, or Quilt Sir for that matter, you just probably just nodded your head 9x. Maybe you even just ticked through a mental checklist that sounded something like this. “Umhm. Umhm. Yup. Check,” etc… I’m sure there are more things we could add to the list, but y’all know what I’m talking about. We are Quilt People. Kindred spirits. Fellowes. Comrades. We “get” each other. Seems to me that what we need is something to provide solidarity as we head out to our meet ups. We need something that makes us instantly recognizable as a group, whilst still retaining our individuality. Yes. You read that correctly. When this club has meetings, we wouldn’t just show the quilts we’ve made, we would also WEAR the quilts we’ve made. You could wear it in any fashion or configuration you like. You can bind a hole in the center and wear it like a poncho if you so choose. It will be like a quilty biker gang type-thing…but with no violence, and a Red Hat Society kind of flair. 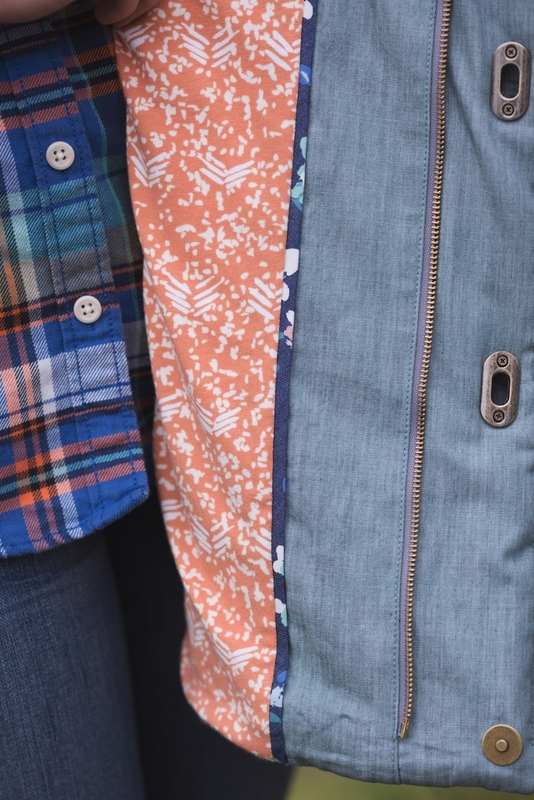 We’d be steppin’ out in all our glorious, quilted frivolity. It’d be be marvelous. It’s going to catch on, mark my words. You heard it here first. A few weeks ago when Christopher, of The Tattooed Quilter fame asked if I wanted to be involved in the blog tour for Art Gallery‘s new line The Denim Studio, I played it totally cool. By cool I mean I “squeed(! )” but only on the inside. I silent squeed. I hashtag squeed. I didn’t want to let my fangirl out all crazy and embarrassing like. Can you imagine? #mortified. I let that happen once at a Garth Brooks concert and he actually stopped what he was doing to ask me if I was ok while he was onstage. True story. I have witnesses. What Christopher didn’t know when he asked if I wanted to join the tour is that I had already emailed Art Gallery a few weeks prior begging asking if I could get my hands on some of their new denim because I had this great idea that I just had to try. I had drooled over pics from Quilt Market along with everyone else. I’m sure my fellow Quilt People out there can commiserate that seeing Market stuff on social media can be equally as agonizing as it is exciting. It’s like the worst kind of look-but-don’t-touch window shopping. Ugh. Water, water everywhere but not a drop to drink. At least not for awhile, that is. Naturally, I agreed to be part of the tour. Arm sufficiently twisted, I settled on the Cascade Duffle Coat pattern from Grainline Studio and set to work on sourcing all the details I needed to make the coat in my mind come to life. 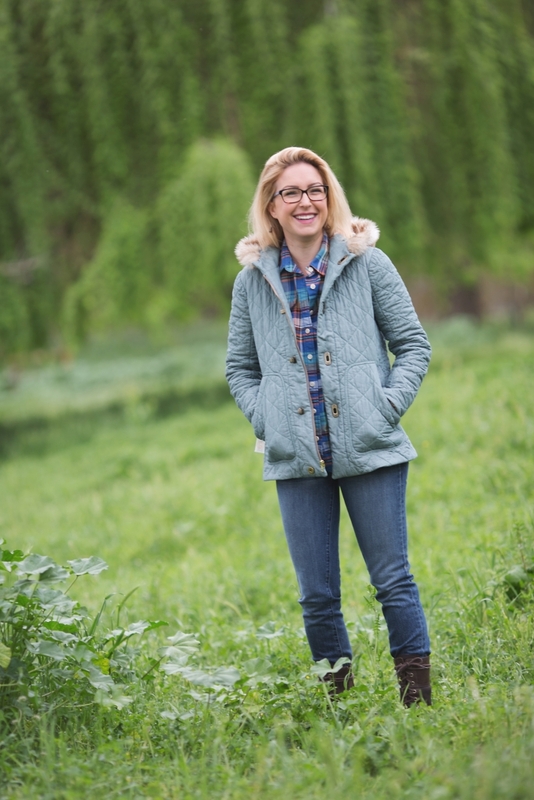 Not only had a coat long been on my sewing “to-do” list, but I had been coveting quilted coat of my own making for a month of Sundays. I had three fundamental goals for this project. One was to demonstrate how these gorgeous fabrics could be used for garments and quilts alike. From the moment I first laid eyes on them what excited me the most was their universal appeal to sewists of all kinds. Second, I wanted a functional garment that I would actually wear. Ask other garment makers and they will attest that sometimes you just don’t like the clothes you make and it’s a bummer. I hate it when this happens. I was determined it would not happen with this project. Lastly, I wanted a finished piece that I felt made an unequivocal statement about who I am, my style, and what I do. I can honestly say I feel like I accomplished what I set out to do. Check, Check, and Check. In the end I made some significant changes to the pattern. Some were minor, like the length, the addition of the fur trim, the twist locks (which I got here), and the pockets. Others gave me a run for my money and seriously tested my drafting and construction skills, like the neckline and zipper mods. Truth be told, I almost didn’t do them. It probably added a whole day to the project because I ended up have to make a sample just to be sure my calcs were correct. You can see a short video of that sample on my Instagram feed. In the end I’m so glad I made the changes. I feel like it makes the garment more wearable and I learned a ton in the process. All good things. This project was an epic make for me and I am incredibly proud of it. It turned out exactly how I pictured it in my mind right down to the texture of the quilting. I could not be happier with the result. I feel like this more than any other garment I have made is a true expression of my identity. After all, isn’t that what this whole sewing thing is all about? Crafting things we love that help us put forward our best and truest version of ourselves? I’m proud of my community and I’m proud of who I am. There’s a good chance if you see me and its colder than 70 degrees, I’ll be wearing this coat…and probably doing this (see below). Because I’m a supreme dork…a fact I’m also proud of. Hey, it’s my freak flag and I’ll fly it if I want to. 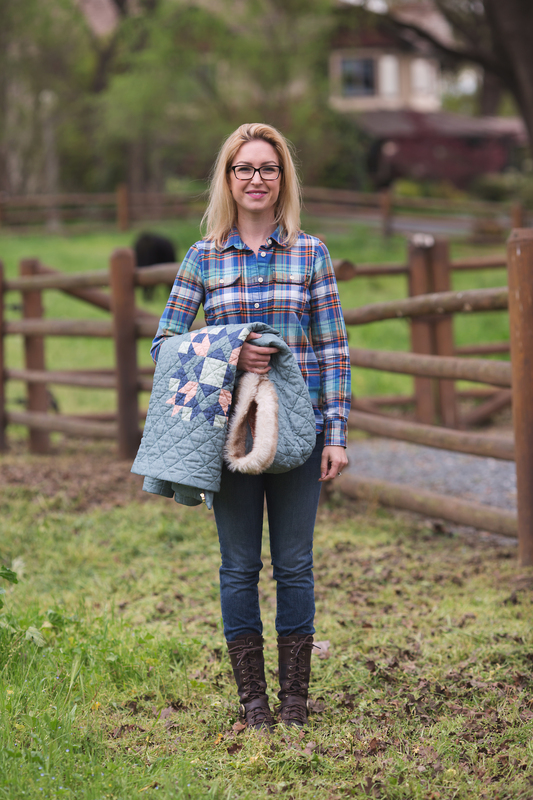 Start wearing your quilts and join me. The Quilt-Wearer Club accepts any and all applicants who are willing and eager to wear their quilts. Get onboard with this…you won’t regret it. If you’ve been following along with The Denim Studio Blog tour there’s still one stop left after this. Woohoo! If your just joining in and you missed the first leg, don’t fret. I’ve got all the details below to help you get caught up. Now go forth my quilty comrades. Go forth and sew all the things, quilt all the things, but most importantly, wear all the quilts. For other great ideas on how to use these amazing fabrics check out #TheDenimStudiobyAGF on Instagram! Thank you Diane, and thanks for reading. Oh my gosh! I love this! 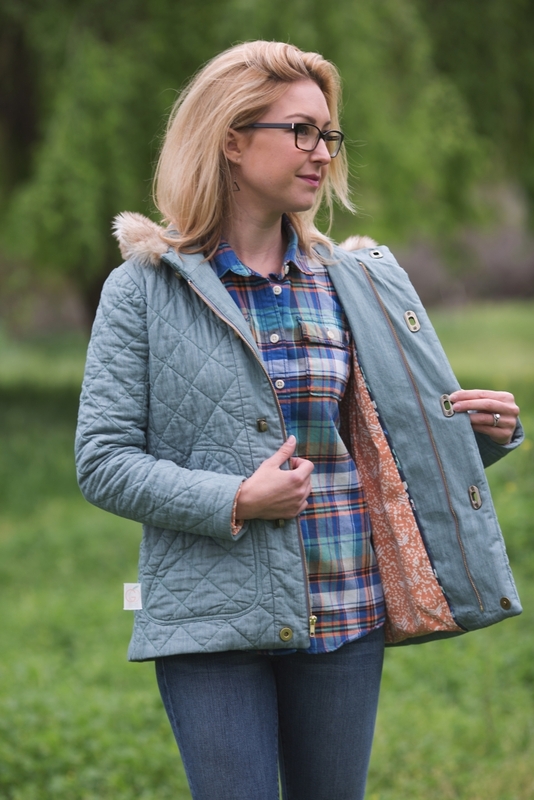 I was actually recently looking for cute ways to wear quilty goodness! This is so perfect! 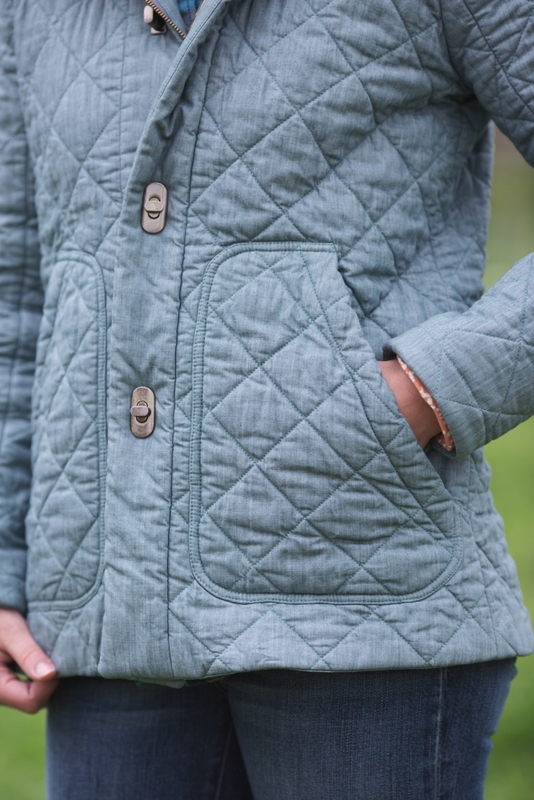 Every detail of this inspired coat is perfection! Now I’m in trouble as my daughter wants a quilted dress so badly!! You must do it Dolores! I’m dying to see what a quilted dress would be like. Jen, it is perfection! What a great reveal. Look forward to seeing it in person sometime! Thank you Jess, and thanks for stopping by. you can see the happiness in your face and in the photos. Yay you! I hope someday to spot this showstopper out in the wild, I for sure will know it is YOU!!!!! I saw this on indiesew tonight. I am just learning how to sew. I’ve had a nice sewing machine for years that I have only used maybe three times, and I bought a serger yesterday in attempt to begin making some clothes for my children. 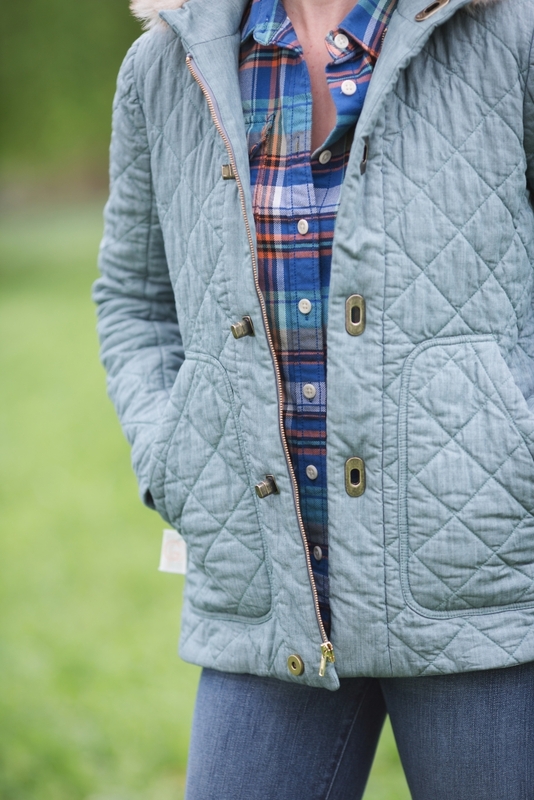 I LOVE this quilted coat. I, being the novice, obviously have no idea where to start (other than owning the original pattern) to make a coat like this, but I hope to get there one day. It’s totally going on my sewing wish list. Thanks Frankie. Indiesew is a fantastic site for all skill levels. Allie has really done a wonderful job building a community there. She has tons of great tutorials and tips. You will get there ;-). Don’t fret. Practice makes better. 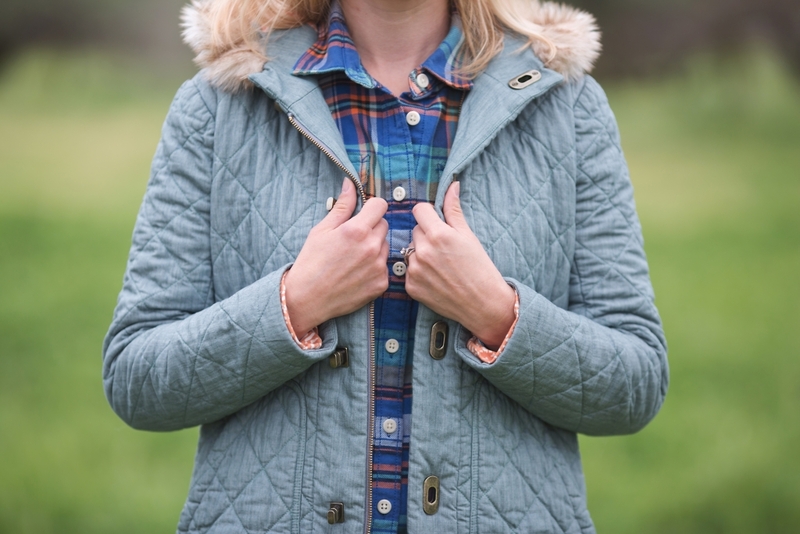 There are lots of coat patterns out there that aren’t as difficult as you might think. Yay Lisa! So glad you’re in the club! And Thank you. You are totally inspiring! I totally want to make this coat. Thank you! Absolutely stunning, Jenn. Well done! and inspiring! 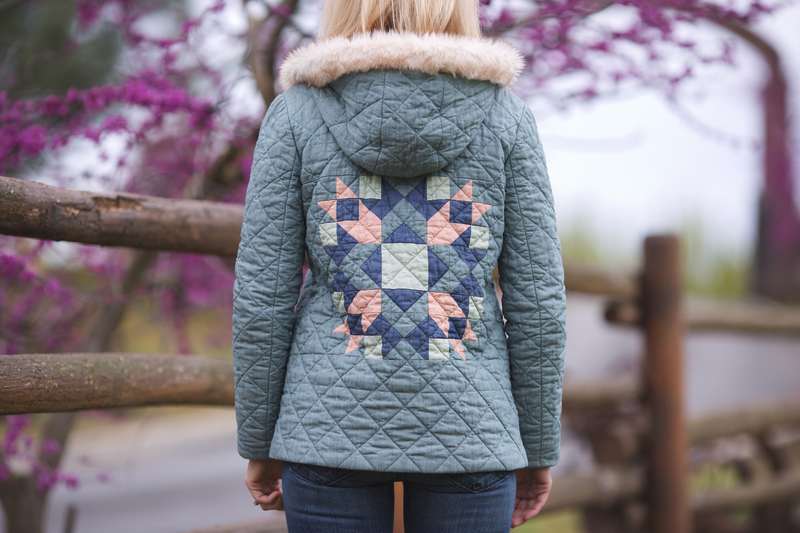 This is beautiful, and really inspiring because I have been meaning to make a quilted Cascade coat. Just one thing I am not 100% clear on is how you interfaced. Di you quilt the top on wool batting and interfaced it afterwards? I just got it. You used the interfacing as lining. Reading skills = zero. Yes Aurelie. The use of fusible interfacing was 2-fold. 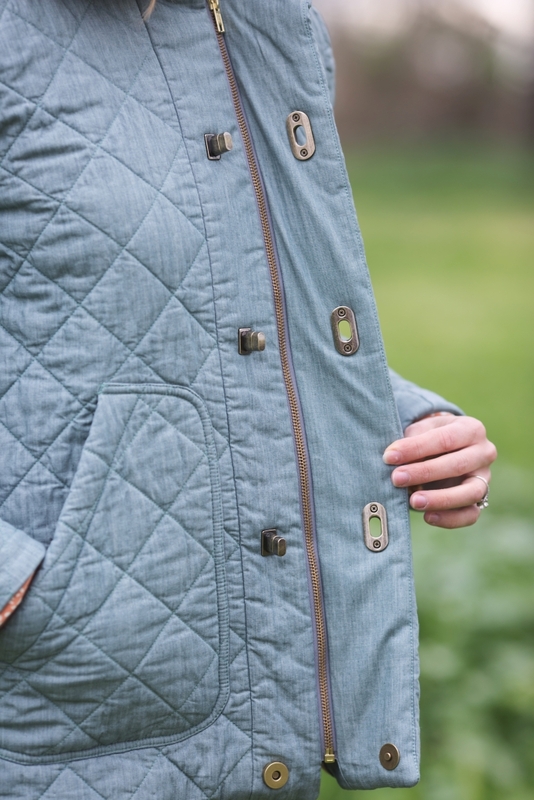 It served as BOTH the “backing” to the quilted outer shell and the interfacing of the garment. Additionally it allowed me to eliminate the cutting of all the interfaced pattern pieces. 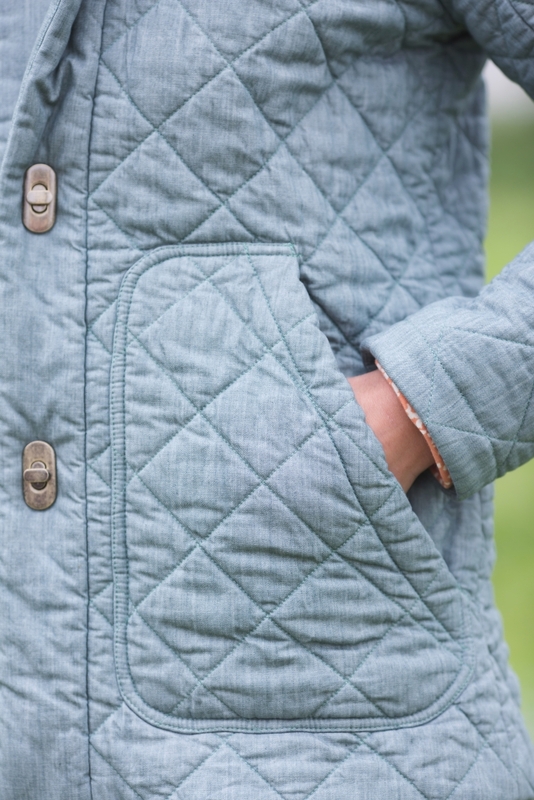 The whole coat was essentially interfaced because the whole coat was quilted. I think you got it but let me know if you have anymore questions. I’m happy to help. You seriously did a fantastic coat!!! The fabric is lovely inside and out. Wear it with pride and show your talents. Just saw this in May, but enjoyed all the same. Thank you so much! I do wear it proudly. One of my All-time favorite makes for sure. 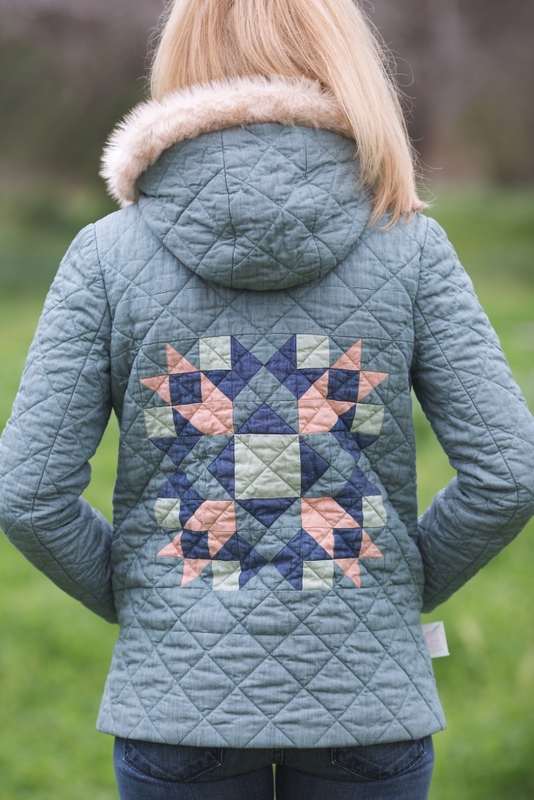 Hi I LOVE LOVE this version I love the twist locks and the quilting Im thinking of making mine out of dark navy duck cotton and waxing it for our long northern canadian winters, quilting it in wool like yours and adding the twist locks.. any more tips on the best ways you learned from making yours? did I say love it already ? !